Pedigree: This week’s Pioneer Focus is awarded to junior strong safety Demarco Donaldson for his recent honors on the football field being named 2nd Team All-GLIAC. 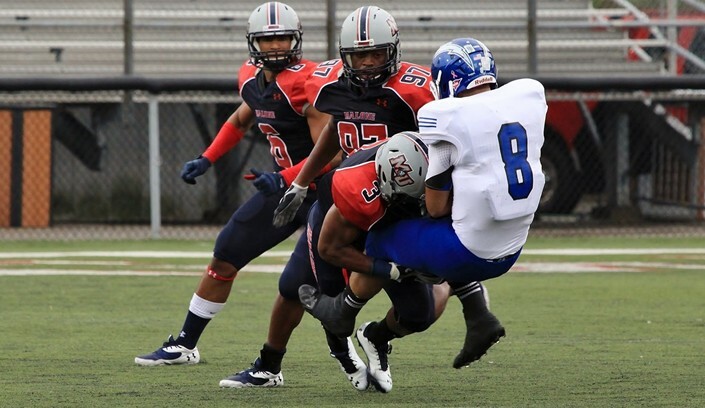 The football team wrapped up the season this past weekend, and despite suffering an injury that caused him to miss the majority of the game, Donaldson managed to tally 119 tackles for the season, ranking second in the GLIAC. Out of those tackles, 76 were solo, which led the entire conference. Donaldson also showed a knack for stripping opponents of the football with a total of five forced fumbles, which again led the conference and tied for fourth in the nation. Donaldson also broke up three passes and recovered a fumble in the season. Q: Favorite aspect about football? A: Hitting people that’s what I do, I’m a hitter geez. Q: Favorite food at Thanksgiving? A: It has to be the Macaroni & Cheese. Q: If you could be a superhero, who would you choose and why? A: I would be the Hulk; he can turn a negative into a positive. For example, his rage was his strength….Then again I like beast, wolverine and the hulk. Q: What is your favorite kid’s movie? A: I’m scared of snakes like crazy. Q: Pumpkin pie or peach cobbler? Q: What are you thankful for this year? A: I’m thankful for having the opportunity to be a college athlete and playing a sport I love while I get a degree at the same time. A: Not being able to take care of my mom. A: Swedish fish and purple Mike and Ike. Q: Someone who has influenced on you? Why? A: My mom; she never lets anything keep her down and she is my biggest encourager. Q: If you could meet one person, past or present, who would it be and why? A: Ed Reed, so I could get some of his knowledge about the game I love. A: I see myself as a household name in the NFL and financially stable, married with a child or two. Q: One thing most people don’t know about you? A: Most people view me as an intimidating football player, but that’s just me on the field. Also, I came to Malone as a walk-on. A: I had an interception my sophomore year in high school to win the game. It was the first time I realized I could play with anyone if I put in the work. A: Judge a man not based on what he’s good at, but how he does with the things he struggles with. Q: How did you end up at Malone? A: I don’t know how I ended up at Malone, and feel like my talent should have took me further, but since I’ve been at Malone it has humbled me. I’m motivated to prove a lot of people wrong and also motivate others to chase their dreams. I have faith it will work out. Tim Woods is a sports writer for The Aviso AVW.